I find cities a fascinating phenomenon, especially the ranking of what city is the world’s largest, most vibrant, or most global. 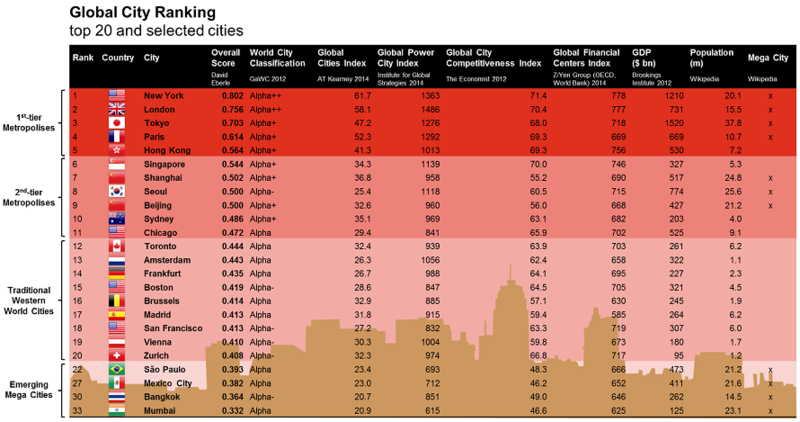 To satisfy my curiosity I compiled my own global city ranking using a meta-score based on 6 publicly available indices. I looked at the top 20 cities as well as a few selected locations based on my personal interest. The results are not very surprising, but in my opinion still interesting. What you would expect, New York and London are at the very top. They are also the only two Alpha++ cities according to the World City Classification by GaWC. Emerging mega cities: very large cities in developing countries that are still lagging behind in the scoring due to a smaller GDP (which is growing faster than the world average) as well as smaller geopolitical and economic influence outside their respective home country or region (Mexico City’s or Mumbai’s influence probably is mainly within their country). GaWC world city classification: groups cities into 6 clusters from Alpha++ cities (New York and London) to sufficiency level cities (e.g. Bremen, Bern, and Cebu) based on their level of connectivity through four advanced producer services (accounting, advertising, finance/banking, law). I defined Alpha++ as 1.0, Alpha+ as 0.5, Alpha as 0.2, and Alpha- as 0.1, therefore giving strong weight to this indicator. AT Kearny’s global city index: measures how globally engaged a city is across 26 metrics in five dimensions (business activity, human capital, information exchange, cultural experience, and political engagement). Global power city index: a comprehensive study of global cities published by The Mori Memorial Foundation in Tokyo based on six overall categories (economy, research and development, cultural interaction, livability, environment, and accessibility) with a total of 70 indicators. The Economist’s global city competitiveness index: a ranking of cities’ competitiveness according to their ability to attract capital, business, talent, and investors. Global financial centers index: a ranking of the competitiveness of financial centers based on over 80 indices with data from the World Bank, the OECD, and the Economist Intelligence Unit published by Z/Yen Group. Gross domestic product: I defined a 1.0 as the highest GDP (which is Tokyo), and scored the other cities proportionately to their GDP. Population (measured by urban area) and the mega city indicator (being part on Wikipedia’s mega city list) are not part of my meta-score global city ranking, but helped me define the clustering. There are many obvious limitations to my meta-score. Some of the indices use the same or similar metrics, which biases my analysis towards certain metrics as they are counted multiple times. Moreover, I have not sense-checked the individual metrics for relevance or weighting. My rationale is that these indices are well-established scoring systems that I can trust. My goal was to consolidate these different global city rankings into a single view, and maybe deriving which city to live in next.